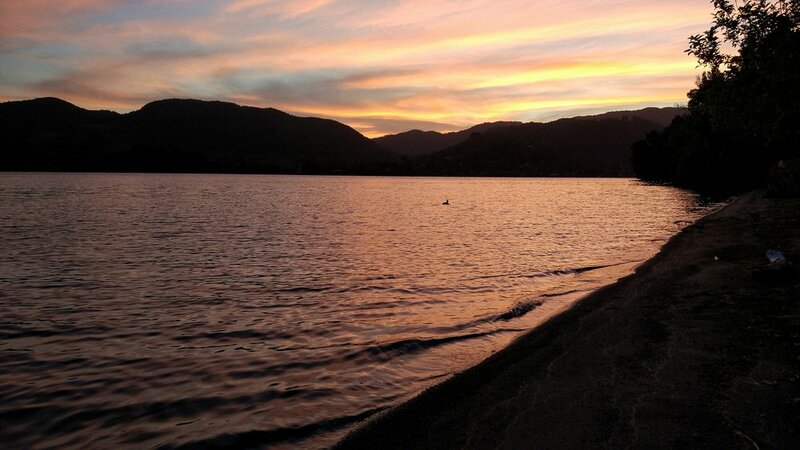 Rotorua is often overlooked by Kiwis and discarded as a tourist trap. And while there might be a grain of truth in this, there are heaps of things to do in Rotorua that attract locals. Two of them are the Tarawera Trail, a 15 km hiking trail along Lake Tarawera. The other is Whakarewarewa Forest, or Redwoods Rotorua, a heaven for mountain bikers. So, after about a year away, we were finally back in my Rotorua. As we got closer to town I wind down the windows and take in the town’s very own smell. The earth crust where Rotorua sits on is very thin for earth propositions, which leads to of geothermal activity. As a result, steam and the smell of sulphur is omnipresent and colourful geothermal fields and bubbling mud can be found everywhere. For a change, we didn’t primarily come to Rotorua for the steam and mud but for hiking and biking, two other activities that are huge in the area. 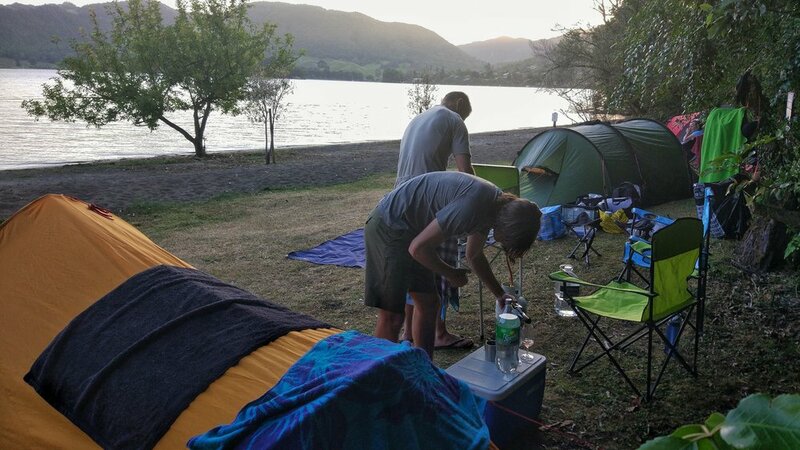 We arrived at our Lake Okareka campsite in the early afternoon and set up our tents right on the shore of Lake Okareka! Only about five steps away from the water, awesome! It’s yet another DOC campsite, because, to us, they are just the best! They are less structured and usually, you get to choose your own spot to set up. They are also often cheaper than the “regular”, private campgrounds that usually feel too packed. However, DOC campsites are usually a lot more basic. The toilets at Lake Okareka campsite are long-drops and there was no water from a tap and no shower. Then again, we were only here for 2 nights and there was a pretty lake right in front of our nose and the water warm enough to swim. Who needs a shower when you can have a dip in a lake instead? After we pitched the tents and marvelled at the view we’d have for the next couple days, we got our bikes ready and drove the 15 minutes (by car) to Whakarewarewa Forest, better known as Redwoods Rotorua Forest, thanks to the name-giving trees. There are two different entrances to the forest that are about five minutes drive apart from each other. One entrance is for the walkers and the other for bikers. A very clever way to prevent arguments between the two. Rotorua Redwood Forest has a whopping 130 km of single track trails that cater to kids, intermediate bikers and the pros. The trails are marked with names and from grade 1 (easy) to 6 (“How is this still a trail?”). The unbelievable thing is, this biker’s paradise is actually FREE to ride, there’s no entrance fee! Only if you want to take a map (and I advise you do that), you’ll pay 5 NZD. For a few Dollars more you can buy a microfleece version of the map. That way you won’t get lost AND you can always keep your sunnies clean. We realised pretty fast that we did well to get a map because the trails are not quite as well marked as they are at Woodhill in Auckland. We often had to stop at trail intersections to figure out where on the map we were and where we wanted to go, just to realise at the next intersection that we weren’t going the direction we thought. At one point we got lost on some path that hasn’t been used in a while and I got a bit nervous we might end up somewhere I couldn’t ride and get stuck (still being new to the whole single track thing). It was all good, however, and we soon found our way back to the official trails. And wow, those trails are fun to ride! My favourites where The Dipper and Roadside Challenge, and I’m sure, once I actually dare to go faster it’s going to be even better! After 2 hours of riding it was time for dinner back at the campsite. Getting better and better at fancy camping, we already prepared most of our food at home and all we had to do was cooking some steaks, pour a glass of wine and watch the stunning sunset over the lake. We heard from some other campers that there were glowworms on the walking path that starts at the parking, so after the sunset, we went on a little walk in the dark. And we did see some shiny little glowworms. Not as many as there were at Waipu Caves but still really cute. The next morning, we got up after sunrise (I didn’t manage to get up for sunrise this time round) and drove over to Lake Tarawera, because we had a Tarawera Trail water taxi pre-booked from the landing to the not-that-famous Lake Tarawera Hot Water Beach. Yup, there is more than one Hot Water Beach in New Zealand, and one of them lies on Lake Tarawera. The ride with the water taxi was beautiful, the water still and green and the hills covered in Fern trees and blooming Pohutakawas, Mount Tarawera volcano towering at the other end of the lake. Rotorua Hot Water Beach was surprisingly full. It seems to be a favourite spot for day trippers with a boat and I can see why. The hot water spring was apparently very hot, around 85°C as we’ve been told. But it mixes with cool water from the lake which makes it nice. We didn’t take a dip, though, because the driver of the boat gave us a great tip for a hot water pool along the way. Hot Water Beach is also a DOC campsite and would probably make for a great night. To get to the start of the Tarawera Trail, you’ll take a left along the beach (looking from the water). The whole trail is undulating for about 15 kilometres (around 5 hours), but the longest uphill part is right at the beginning of the trail. After about an hour of walking through the bush, we reached the first picnic/toilet area (long-drops). There’s an unimposing trail that turns right but has no signage. We followed the trail as instructed and ended up on this amazingly beautiful bathing spot. The surrounding trees mirrored peacefully in the water and we could see why this place can’t be found on official trail maps. It’s supposed to stay as secret as possible. The water was just lovely to sit in. A relaxing 38°C, as we’ve been told by the boat driver. It’s not a hot water spring where the hot water bubbles out of the ground. It’s more like sitting on a hot pan, as the water gets heated up through the pebbles on the ground. The more I dug your hand into it, the hotter it got. Isn’t geothermal activity just amazing? The rest of the Tarawera Trail is also extremely beautiful. There is a section that seems to be prone to landslides in bad weather, so better be careful and check with the local DOC if it’s safe to tramp. Every time we came back down to a valley, the face of the forest changed, surely about 6 or 7 times the trees changed completely. We wondered (and still do) whether this was of a natural cause or if humans had to do with this. We stopped one more time towards the end of the trail because at a point I got extremely tired and needed a 10 minutes speed-nap and some food for a sugar energy rush. About an hour later we were back on the landing. The last part of the trail is lovely to walk as it’s closer to the lake and the water is just so clear! There are some really nice sand banks for swimming but we have our very own lake so we decided to go back to the campsite and have a swim there. It turned out quite chilly since the weather suddenly changed and rain started. But listening to rain in a dry tent is one of the cosiest things, so we didn’t care much about it. And it’s New Zealand after all, rain comes and goes. It really did stop in the morning, even though it was still grey. But we didn’t care so much since we were about to go back home anyway. But we couldn’t leave Rotorua without one bit of geothermal activity, that would just be wrong (for me). It has become a bit of a tradition for me to try and visit Kuirau Park whenever I’m in Rotorua and see how the landscape changed since last time. So we went to Kuirau Park, which is a city park and at the same time a (free!) geothermal wonderland. The park has bubbling and steaming ponds everywhere and the smells of sulphur are quite strong. I find it kind of unreal and amazing that this place is just a public city park. Only in geothermal Rotorua. The highlight of the park is a steaming lake and it really did a great job this time, because as soon as we got closer we couldn’t see a thing anymore and were surrounded by warm, wet fog. The wind sometimes blew some of the steam away and gave a glimpse to parts of the lake. It’s a very mystical experience that excites me anew every time I come back to the park. Whakarewarewa Forest bike park offers an amazing range of fun trails for all skills. It’s amazing that a huge bike park like Rotorua Redwoods is free and even getting a little lost in the bush doesn’t stop the fun. Tarawera Trail review: The undulating trail is easy to walk with moderate fitness. The ups and downs can tug on the nerves towards the end. But it’s a beautiful trail and easy to find your way. I’m constantly worried about getting lost in the bush. There’s no need to worry here, it’s all very well marked. Tip: If you would like to stay at the Hot Water Beach campsite you can send your luggage by water taxi and walk from the landing to the campsite. The water taxi can pick you up the next day. Have you walked the Tarawera Trail or biked Whakarewarewa before? Did you like it? Or is it on your bucket list (or not)? We want to know! Tell us in the comments below! Did you love the article and / or found our tips helpful? Then please share it with your friends and whanau (family) and pin it to Pinterest to make sure they also learn about this place. At the best location you can find in Rotorua, the hotel sits between the lake and Eat Street in the town centre. Modern hotel with indoor pool and spa, you can’t go wrong. Wake up to this view every morning! Located overlooking Lake Okareka, this bach is about a 10 minutes’ drive from Rotorua town centre. The charming house can accommodate 5 - 6 people . We are Alex And Chris. We are living and working in Auckland but in our spare time we love to explore what auckland and its surroundings has to offer or go on weekend getaways from auckland. when we’re not out and about we’re restoring our cute 1977 caravan with a lot of love and some talent.